This is not a manuscript at all. It is the first draft of the book. No author intends that the first draft of his book be published. He appoints an editor and together they work on the book to produce the manuscript which will ultimately be submitted to the publishers. In this case, Prabhupada wrote the first draft and then worked with Hayagriva and other editors to prepare the manuscript for his Bhagavad-gita As It Is, which was ultimately presented to Macmillan & Co. for printing. On his website he debunks “The myth that Srila Prabhupada and Hayagriva together carefully reviewed the completed text of Bhagavad-gita As It Is“. He does this by debunking a statement by Govinda dasi, who saw Srila Prabhupada and Hayagriva working together on editing Prabhupada’s books in 1968 in Los Angeles. Prabhupada and Hayagriva were actually working together on editing Srimad-Bhagavatam at that time. And according to Jayadvaita, that “proves” that Prabhupada and Hayagriva did not work together on editing the Gita. Strange logic, but we are expected to believe the Swami anyhow. So Hayagriva is negotiating on Srila Prabhupada’s behalf with a local printer to print Prabhupada’s Bhagavad-gita As It Is. Finishing his translation of Bhagavad-gita As It Is, working with Hayagriva Prabhu to edit it and getting it printed are clearly the most important projects on Srila Prabhupada’s agenda at this time. The history is the history. Srila Prabhupada worked on the first draft of Bhagavad-gita As It Is extensively with both Hayagriva Prabhu and Rayarama Prabhu. In the three months Hayagriva went through practically every verse with Srila Prabhupada and Prabhupada also sent many corrections to Rayarama Prabhu later on. At that time Macmillan were only able to print 400 pages, so Rayarama abridged Prabhupada’s Bhagavad-gita As It Is. Prabhupada was not happy with this and wanted to publish the complete edition. Hayagriva was again called on by Srila Prabhupada for producing the manuscript, which was submitted to Macmillan for the publication of the complete 1,000 page edition in 1972. At this time there were at least exchanges of letters between Srila Prabhupada and Hayagriva and Prabhupada was still giving him many instructions related to the editing and answering the questions he had in regard to the editing. Thank you Prabhu for clarifying the matter. What has the BBT trustees and GBC have to say about this? On whose authority did Jayadvaita Swami do this? Its mind boggling. Please accept my humble obeisances. All gories to Srila Prabhupada! Madhudvisa prabhu, hari bol, I just read where you said that JAS has his own reasons for doing this editing work. What are they, in your opinion ? Secondly i have in hand the 1998 BBT publication named “Responsible Publishing”, and thought it interesting to ask you to give your take on this so called justification for editing. I do not know Prabhu, what Jayadvaita’s actual reasons for making all these changes are. I only know that it is completely insane in many, many cases. You just cry. If you read the original text in Prabhuapda’s original books and then read what Jayadvaita has done to it. It is insane. 99% of the time there is no detectable problem at all in the original book. But he just changes it. Why he does this when Srila Prabhupada so much stressed the importance of not changing I can not understand Prabhu. To me it is insane. Totally insane. I can find no justification at all for the majority of the changes. Sure there are a hand full of real typographical errors, there is no way any justification at all for the thousands of changes he has made and mostly you can not detect any improvement form any point of view and in so many cases he has changed the philosophy in subtle or not-so-subtle ways and simply mangled so many of Prabhupada’s clear transcendental points. This “Responsible Publishing” is complete nonsense Prabhu. It is not responsible to make thousands of completely unnecessary changes which do not improve the book in any way and in many cases damage it when Prabhupada clearly ordered that there should be no changes. It is another insanity. Trying to call this responsible. So my conclusion is that Jayadviata is either insane or he has some other devious motives as to why he wants to destroy the authority of Prabhupada’s books. You can ask him but of course he will not tell you the truth. He tells so many lies. How can we trust a person who tells so many lies and must either be insane or have some devious motivation for making unnecessary changes to Srila Prabhupada’s books? You just have to look at the original and what he has changed it to. If we are kind we can call him insane, if we are not so kind we would have to suspect he has more devious motivations for the changes. I read much of the information on your site and i am truly amazed at what has happened. But if the presentation was more to the facts and less of a personal grind on Jayadvaita Swami it might be more effective. Also, letting your readers draw their own conclusions without concluding for them might make the whole presentation more dignified. That’s just my opinion but hey, the world loves a good fight! I hate voting on anything but if it ever came to a vote i would certainly vote to return to the original Bhagavad-gita As It Is. I never distribute or recommend anyone to read anything else but the originals of Srila Prabhupada. I do recommend other books by other authors but when asked about the ‘book changes’ i always recommend reading the originals of Srila Prabhupada whenever possible. My favorite of all are the first three volumes of Bhagavatam that Prabhupada brought to America on the Jaladutta. Even the poor language structure and misspelled words in those original volumes adds to the charm [Srila Prabhupada did want those corrected and they were]. The purity and the urgency of Srila Prabhupada’s translations and purports shines through like millions of Suns! I have purchased the original Bhagavad Gita As It Is last year and it has completely changed my life. Although I am somewhat naive regarding ISKON and have never been to a temple, I chant daily and try to live through and for Krishna! (Not Easy Though!) 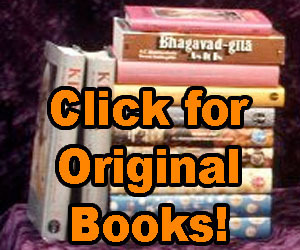 Soon I plan to purchase the Srimad Bhagavatam and it would be greatly appreciated if there was a way to verify the original ten volume edition that A.C. Bhaktivedanta Swami Prabhupada. Because it is a great monetary investment, I want the original and not some revised edition from some self interested “Guru”. Please help me Mhdusdvisa dasa! I want to serve the Blessed Lord as intended by His Divine Grace A.C. Bhaktivedanta Swami Prabhupada and not serve the Lord with blind ignorance. It is bad enough that I am not acquainted with devotees, so I don’t want to be mislead. May Krishna Krishna Bless You, Madhudvisa dasa! That is photographically produced from pre-1977 Bhagavatams. And it is a very convenient size for reading also. I have purchased Bhagvad-gita recently. While purchasing Bhagvad-gita As It Is, I noticed that the size has increased but since I am new to this movement and did not know about this incident, I did purchase it. And I have checked all that you have mentioned in my copy. It is definitely the revised edition. Can you suggest me now how can I get the original copy? I do not want to be misled after knowing this. I read much of the information on your site and i am truly amazed at what has happened. I’m 2nd generation devotee, initiated by Prabhupada’s disciple. I’ve come in contact with Bh.Gita’s translation, not even English publication… I’m almost positive that 1st published translation in polish language was also based on original Gita as it is, but I have to dig very hard to find it. I took part in book distribution but we distributed revised version of Gita. Have you (or anybody) openly presented this subject to GBC ? There is a big difference between sober and self realized..you are right prabhu….Just because you might be sober doesnt make you self realized.All Glories TO HIs Divine Grace A.C.Bhaktivedanta Swami Prabhupad. Please advise where we can check the changes on Srimad Bhagavatam as I have a copy of the pocket edition and want to ensure before I start reading that it is the original version. There are no changes to Srimad-Bhagavatam so far BBT are still printing the 1977 edition unless they have changed very recently. Prabhuji, thank you very much in enlightening me about the great blunder that has been made regarding the ‘revised and enlarged’ Bhagavad-Gita. Indeed it is not the Bhagavad-Gita As Is Is. Srila Prabhupada so many times instructed and preached that we should accept the transcendental message ‘as it is’ without any addition or subtraction. But unfortunately, somehow or the other it has happened. A very sad state indeed! So many millions of Gitas are being distributed by the devotees but unfortunately all of them are not ‘As It Is’. Prabhuji, how can we ISKCON devotees distribute the original ‘As It Is’ Bhagavad-Gitas now? Is there any way for you to make them available in bulk to all the devotees who need them for distribution? Also Prabhuji, since i stay in India, i was thinking that the Bhagavad-Gita in Hindi, Marathi, Telugu, Tamil, Gujarati, and other languages must also be the translated version of the ‘Revised and Enlarged’ edition of the Gita. So Prabhuji, i am ready to translate the original ‘As Is Is’ Bhagavad-Gita into Hindi, which is the national language of India. If you desire so then kindly give me your permission and blessings to translate it. Also, once translated how to arrange for printing and publishing? Again i offer my unlimited gratitude to you for your spotless dedication to Srila Prabhupada’s mission. BBT in Mumbai are already printing Prabhupada’s original 1972 Bhagavad-gita As It Is. You can purchase cases of it from them. KBI are also printing their original Prabhupada Books in India and they are available through ISKCON Bangalore. So the original books are already being printed there in India, you just have to organize to distribute them. As far as Hindi, Prabhupada’s original Gita was already translated into Hindi, you do not need to translate it again, just find the original Hindi translation. But really translations of Prabhupada’s books will never be the original books. If one is really serious about reading Prabhupada’s books and studying his teachings he needs to learn English and read in English and you know English, along with Hindi, are national languages of India. So Prabhu I think it is best to just concentrate on distributing Prabhupada’s original English books in India. Every intelligent person in India practically can read English. i have come to know that there have been changes to the Necatar of Devotion also. Do you know what are those changes? So please download this file and compare it with the current BBT NOD and let us know what differences are there. It is almost 2 AM ( I am in India) and my sleep has literally vanished reading this most unfortunate trickery done by this Jayadviata , i am new to Krishna Consciousness and i was about to start my Gita in a little time but when i compared my copy i found it is the changed one and not the original ! I am really panicking if all the books have been changed like this , especially the Bhagwatam which i intend to read next , please guide me as to how i can find the original books , i am really panicked with this as misguided knowledge can be even more harmful than no knowledge. Please help. Prabhupada’s original Gita, the 1972 edition, should be available now from every ISKCON temple, at least in India. It is printed by the BBT so it should be available from every ISKCON temple. At least as far as I am aware the Srimad-Bhagavatam being printed by BBT is stil the 1978 edition. Unless they have done it in the last year or so they have not changed the Bhagavatam. Only they have added bogus rubbish to it after the end of Prabhupada’s translation at Canto Ten Chapter Thirteen. But before then you should have Prabhupada’s original Bhagavatam from the BBT. I feel compelled to comment that Prabhupada’s original 1972 edition has some special crafting of English language semantics that code deeper revelations on the subject matter at a subconscious level that could only have been applied in collusion with an native English editor. This embodiment is essential because the original texts are coded similarly. Any change no matter how minor has the potential to corrupt the underlying messages and dilute the process, something Prabhupada was acutely aware of as he knows that Lord Krishna has to re-establish the truth once it becomes perverted and Lord Krishna tells us he has reinstated it many times! Either Jayadvaita is unaware of this fact, something I find extremely unlikely as even without devotee association I am aware of it OR he is intentionally undoing Prabhupada’s work. Chant Hare Krishna, be enlightened and happy! I feel compelled to comment that Prabhupada’s original 1972 edition has some special crafting of English language semantics that code deeper revelations on the subject matter at a subconscious level that could only have been applied in collusion with an native English editor. This embodiment is essential because the original texts are coded similarly. Any change no matter how minor has the potential to corrupt the underlying messages and dilute the process, something Prabhupada was acutely aware of as he knew that Lord Krishna has to re-establish the truth once it becomes perverted and Lord Krishna tells us he has reinstated it many times! Chant Hare Krishna and be enlightened!